Earlier in the season, it seemed like Tech’s women’s basketball team was headed into a strong season. It was helmed by freshman guard Elizabeth Balogun and the returning leadership of junior guard Francesca Pan and forward Martine Fortune. Head Coach Machelle Joseph notched her 300th career win with the Jackets, and Balogun had established herself as ACC Rookie of the Week before the conference competitions had even begun. Since then, Balogun has been awarded the title of ACC Rookie or Freshman of the Week two more times. She is accompanied by her peer, freshman forward Elizabeth Dixon, who was named ACC Co-Rookie of the Week following games against Duke and Louisville. But the wins that rolled in through a relatively easy non-conference schedule have dried up as of late. After a tough loss against the elite Notre Dame team to start the semester, the Jackets rebounded by pushing past Duke with a 70-64 win. However, the team fell to Louisville in a showing that resulted in a final score 61-44, a lopsided deficit for the Jackets. Following the loss to the Cardinals, the team lost again, this time against the Clemson Tigers. In this defeat, the Jackets narrowed their losing margin to a 10-point difference in a final score of 71-61. After the back-to-back losses on the road, the Jackets returned home to McCamish to conquer No. 14 Syracuse in a morale-boosting final score of 65-55, a game in which the Jackets bottled up the Orange’s electric Tiana Mangakahia. 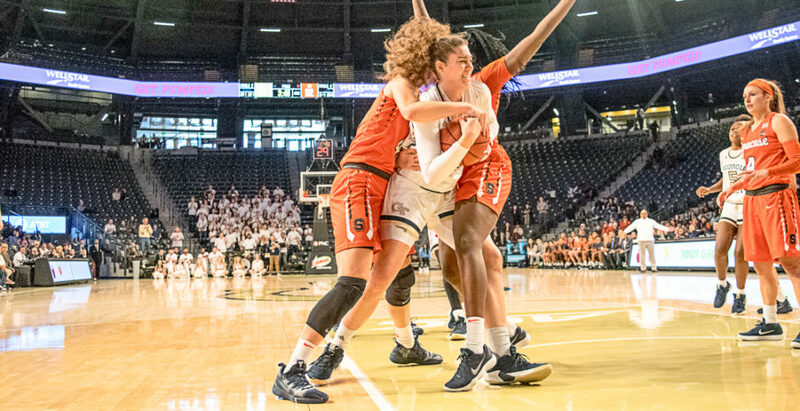 The outcome must have been particularly sweet for Coach Joseph and her team, given that Managakahia came just short of the Carrier Dome’s single-game scoring record when Tech played Syracuse on the road last season. However, the taste of victory did not last long as the women lost to the NC State Wolfpack, who maintained their undefeated streak for the season. Last, but not least, the Jackets narrowly missed a win over the UNC Tar Heels, losing 91-90 in a heartbreaking push to the finish for both teams. Most recently, Tech traveled to South Bend, Ind. to compete against No. 5 Notre Dame. After a first half that resulted in a 41-point deficit for the Jackets, Tech was able to score an additional 37 points. However, Notre Dame put up another 36 points to defeat the Jackets 90-50 in a loss that revealed the apparent youth and inexperience of the Tech team, which Coach Joseph acknowledged after the game. Dixon led the team with a mere 12 points, while sophomore forward Lorela Cubaj put up seven rebounds. The team shot a paltry 21.7 percent from the field, while Notre Dame found itself at a much better 55.9 percent. The Fighting Irish hit two-thirds of their threes en route to an easy win. Amid these recent losses, there appear to be some perfectly understandable results and some that should worry Joseph and her team if their hope is an NCAA Tournament bid. Losing to the likes of Louisville and Notre Dame is understandable; both are powerhouse programs, led by star players who project as excellent professional prospects. But dropping winnable games to the likes of North Carolina and Clemson, not to mention facing a 41-point deficit against any team, shows that the Jackets have a long way to go. Throughout the aforementioned games, Balogun has continued to stay strong and position herself for accolades with career-high statistics such as 35 points in the game against UNC and 31 points in the match up against NC State. Yet, it has become clear that a single outstanding freshman cannot carry the team to victory through scoring points alone. Even as three Jackets posted double-figure rebounds during the Clemson game, aspects of the game such as a 12-for-20 mark at the free throw line, as opposed to Clemson’s 19-for-26 showing, are where the Jackets are falling short this season: correctable but potentially fatal flaws. The Jackets have seven more conference games against Pitt, Wake Forest, Virginia Tech, Clemson, Virginia, Miami and Florida State before entering into the beginning rounds of the ACC Championships. While the team has typically shot above 40 percent, games like the match up against the Wolfpack in which the Jackets shot 34.4 percent will hinder a chance at playing in the NCAA tournament. The team has shown resilience in rebounding from early deficits, but an end-to-end win would do wonders for the team’s confidence. The Pittsburgh Panthers were ranked No. 113 in the nation as of February 2, while Virginia Tech, Miami and Florida State were all ranked in the top 100, with the latter two considered Top 25 squads. In comparison, the Jackets were ranked No. 41 in the nation as of Feb. 4. Although teams such as Wake Forest and Virginia are not as highly ranked, the Jackets will need to bring the consistent drive that they showed they are capable of during the wins against a top-15 team like Syracuse earlier in the season. With each team in the conference, even those that are well out of contention, focused on building its resume in hopes of momentum for the next season or a spot in the postseason this one, no game will be a quick and easy win for Tech. That is particularly true because of the fundamental errors that have plagued Tech in some recent games; shooting free throws at a poor rate will sink them against almost any team. The upcoming games against Pitt, Virginia Tech, Clemson and Florida State will offer the Jackets a home court advantage. Whether they successfully leverage that advantage will go a long way to determining where Tech is playing when tournament season rolls around in a month.